Paper jams do not happen often, but when they do, you are printing off an important document that is needed in a timely manner. Rather than kicking the printer into oblivion, try these known tips to help prevent paper jams. When humidity is low during dry winter months, it is usually best not to fan the paper because it can cause static electricity and in turn cause the pages to stick together making it difficult for the printer or copier to separate each page. 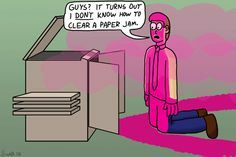 If you have recently removed a paper jam, it’s possible a small piece of the jammed document is stuck in the machine. Inspect the paper path closely for any small pieces that could be left in the machine. We hope these tips will help you get out of a jam!